in the morning at 8:00 AM on March 5th 2012.
which has racked up over a million views online. 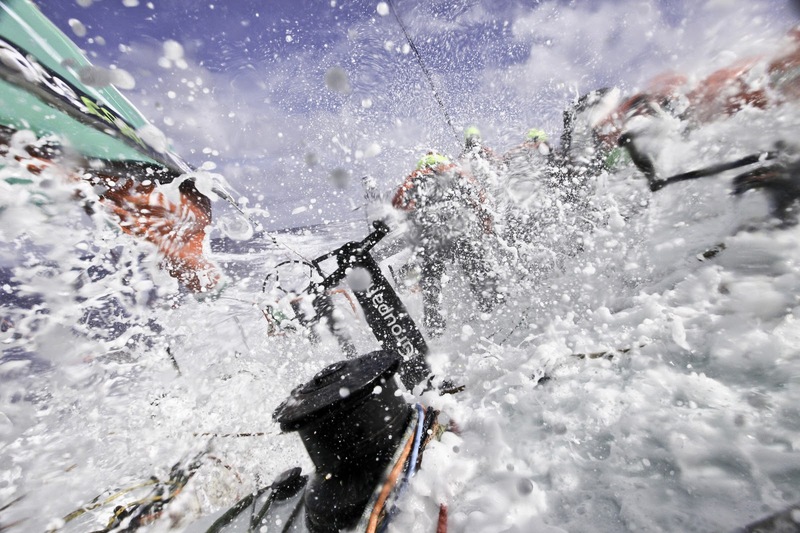 They were apparently caught in a strong ocean current. It was just another day on the beach for holidaymakers off the coast of Rio de Janeiro, Brazil, when a pod of about 30 dolphins swam ashore on Monday. Beachgoers quickly came to the rescue, rushing into the sea and dragging the dolphins by their fins and tails into deeper water. What can experts learn from the footage? The species involved, for one. These are common dolphins (Delphinus delphis), which typically live a long way off shore, says Mark Simmonds of the Whale and Dolphin Conservation Society, a global charity. Had experts rescued the dolphins, says Simmonds, they may have examined the individuals for damage, such as net marks, that may have provided clues. But he says the dolphins in the video appear to be healthy. The topography of the coastline may have disoriented the dolphins, says Michael Moore of the Wood's Hole Oceanographic Institution in Massachusetts. It would not be surprising if offshore dolphins like these had trouble navigating the sandbars and silty seabeds found in shallow waters. Nor is it surprising that such a large number of dolphins would head for land together. Dolphins are social creatures, so it would take only one member of the pod to go astray – say, if it was diseased – and the others would follow. This social behaviour is what makes mass strandings of cetaceans so common. In the last month, for example, an unusually high number of dolphins – reportedly 179 – has been stranded in Cape Cod, Massachusetts. Understanding what's going on in such cases is especially hard because scientists must rely largely on postmortem evidence. Moore and others are trying to develop early warning systems to get to the dolphins while they're still alive. The Brazilian video has widely been greeted as a good news story. But Simmonds is uneasy about this. "There's a clock ticking, so it's important to respond quickly, but it's also important to move them in the right ways," he says. Typically it's best not to touch the animals and to call in experts instead, he says. "Pulling their flippers can dislocate their bones, or even pull a flipper right off." 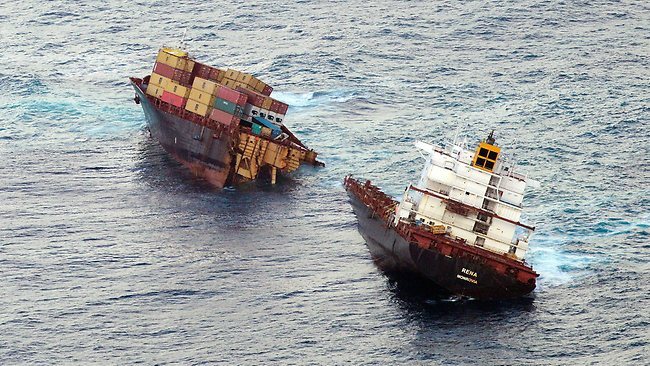 Taking shortcuts and miscommunication have been identified as possible reasons for the Rena hitting Astrolabe Reef. The Transport Accident Investigation Commission (TAIC) has just released its interim report into the accident. 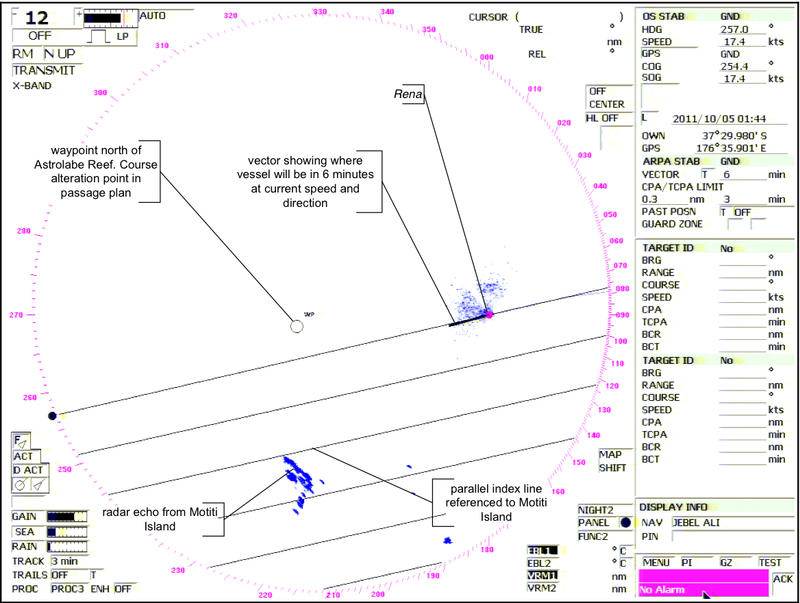 It shows the second-mate began taking the ship closer to the reef at 1.20am because it was running late. Investigator in charge Robert Thompson says the second-mate says he marked a point one nautical mile north of the reef, so he'd know to change course. "The second-mate said he showed the master the charts and pointed out the amended passage plan including the mark north of Astrolabe Reef. The master said he did not study the charts. And the mark was put there after the grounding." Mr Thompson also says the 2am position plot was added after the grounding, and was north of the GPS tracking of the ship's actual position. "He was not able to access the chart because the master and his second mate were leaning over the chart. 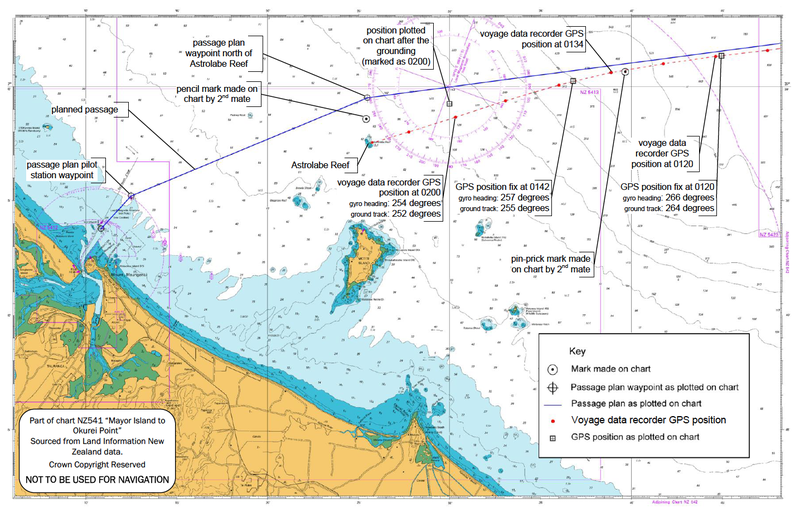 The position was not plotted on the chart until after the Rena had run aground, and then it was plotted on the chart north of the vessel's actual 2am position." Mr Thompson says an intermittent echo on the radar was noticed nine minutes before they ran aground. "But it's also not uncommon to have false echoes and the captain's reaction in this case will be the subject of further analysis." He says there's no evidence the master had been drinking. Mr Thompson says they misread the ship's position from both the gyro compass and the GPS data. 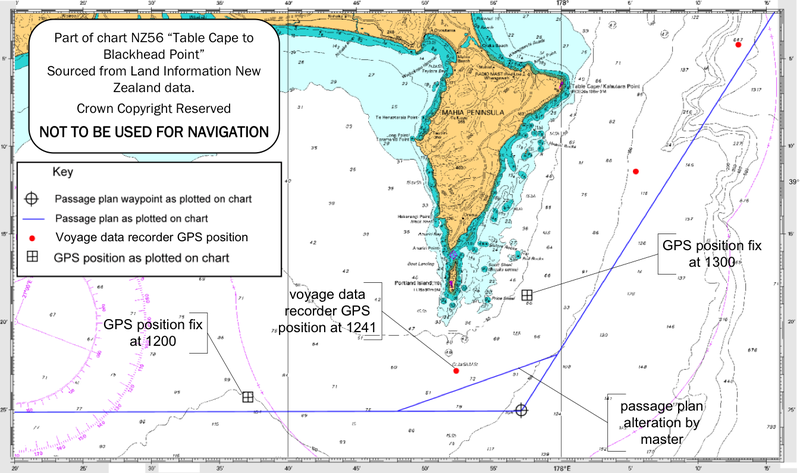 "Under the influence of tide and current and wind and waves and including any compass error, the ground track was two degrees to the south of the vessel's heading." Mr Thompson also says chart plots at 1am and 1.20am were put on different charts and weren't cross referenced against each other. Transport Minister Gerry Brownlee says the report establishes some verified facts that will enlighten ongoing investigations. Analysis, findings and recommendations stemming from the Rena incident will be subject to the Commission's final report due next year. Meanwhile the Bay of Plenty Regional Council says today's report gives some clarity about how the accident happened. Council chairman John Cronin says he hopes the report will help the community in the healing process. He says they'll continue to work to restore their environment and help the community and iwi recover. However Labour's deputy Leader Grant Robertson says while the series of mistakes identified are important, investigating the adequateness of the Government's response is also needed. "But really a thorough investigation into the response, into how people were informed, what kind of communication was there with communities and what we can learn from this is what's really important." But Minister of Transport Gerry Brownlee indicates that won't happen. "We have, as you know, two inquiries that are going on plus a court case so it's not exactly as if this is being pushed to one side." The journey to each of the six coral reef regions provides an overview of the biodiversity of reef ecosystems, their importance to people and local economies, and the types and magnitudes of threats that reefs face, illustrated with vibrant underwater footage of coral reefs and photos of activities that influence reef condition. The Reefs at Risk project raises awareness of threats to coral reefs and provides information and tools to manage coastal habitats more effectively. Since 1998, the World Resources Institute (WRI) has been using GIS (Geographic Information System) models to develop map-based assessments of threats to the world’s coral reefs. Reefs at Risk Revisited, released in February 2011, is the latest assessment in the series and is based on a nearly three-year study that produced the most highly-detailed global maps of coral reef threats to date. The study analyzed and mapped threats to coral reefs from local human activities such as coastal development, unsustainable fishing, and marine and land-based pollution, as well as climate-related threats caused by increasing levels of greenhouse gases in the atmosphere. While the Reefs at Risk Revisited report, maps and data sets are the core components of our work, we found ourselves still searching for a compelling way to convey our findings on these dynamic yet fragile reef ecosystems. We also wanted to generate greater awareness of the unique characteristics of reef habitats across different geographies and the irreplaceable cultural and life-sustaining services that reefs provide to people all over the world. In the tour, the Reefs at Risk Revisited maps come alive on Google Earth with photos and underwater video from each of the major coral reef regions of the world: the Caribbean, Middle East, Indian Ocean, Southeast Asia, Australia, and Pacific, as well as a global-level introduction and conclusion. The journey to each region provides a brief overview of the biodiversity of reef ecosystems, their importance to people and local economies, and the types and magnitudes of threats that reefs face, illustrated with footage of both healthy and damaged reefs. You’ll also experience first hand these fantastically dynamic and productive ecosystems that extend across about 250,000 sq km (96,500 sq miles) of the tropical ocean. Even though this area represents less than 0.1% of the global ocean, reefs are home to as many as 25% of all known marine species. In the tropics, coral reefs are not only a critical habitat for marine species, but they also play an essential role in the lives of millions of people who live near them: they provide food and income from fisheries, revenue from tourism, and protection for coastal communities from storm surges. Among the other products of the Reefs at Risk Revisited project are global maps of coral reefs rated according to level of threat in the present, 2030, and 2050. These maps are available as downloadable KML files on the WRI website for viewing on Google Earth, and also as part of an online map developed using Google Fusion Tables. With these interactive maps you can zoom in to your favorite reef to explore it more closely in your own self-guided tour. We hope that you enjoy our tour and maps, and that you are able to visit a coral reef to learn more about these important and unique ecosystems. With improved understanding, we can manage and protect these resources so that we can all enjoy them and benefit from them for generations to come. Bordered by ten nations and including some of the world's most important shipping lanes and fisheries, the South China Sea is a vital region. Critically important mineral resources, including oil, are thought to be there in large quantities as well. The Chinese have long laid claim to nearly the entire South China Sea. US returns in strength to the Pacific Now that the US is substantially reducing its military spending and withdrawing from present wars, its future intentions, and those places it will seek to control, are becoming clear. The most important will be the Pacific and the South China Sea. “Our nation is at a moment of transition,” said President Barack Obama on 5 January when he unveiled a new national defence strategy. This means the size of the US military will be reduced and some combat missions curtailed, notably mechanised ground combat in Europe and counterinsurgency in Southwest Asia. The aim is to focus more on other parts of the world, especially Southeast Asia and the Pacific, and on other objectives: cyber warfare, special operations and sea control. “The US joint force will be smaller, and it will be leaner,” said defence secretary Leon E Panetta. “But…it will be more agile, more flexible, ready to deploy quickly, innovative, and technologically advanced”. According to Obama and Panetta, the strategy reflects altered circumstances at home and abroad. The US, weakened by the economic crisis, has a ballooning national debt. The department of defence must make spending cuts of $487bn over the next 10 years to comply with the 2011 Budget Control Act; and more cuts are possible if Congress fails to reach agreement on additional budget-saving measures in the months ahead. Abroad, military pressures are not decreasing despite the withdrawal from Iraq, and eventual escape from Afghanistan: the US faces new threats of potential conflict, for instance with Iran (see Iranian options) and North Korea, plus the growing spectre of a rising China. At first glance the new defence policy can be seen as a pragmatic response to altered fiscal and geopolitical conditions, aimed at providing a smaller force with greater capacity to confront future dangers. On closer inspection, one can discern a larger strategic intent. Faced with the inevitable erosion of its status as sole superpower and the rise of ambitious rivals in Asia, the US seeks to perpetuate its global primacy by maintaining superiority in key areas of the world and critical forms of combat. In particular, it will aim to dominate the maritime edge of Asia, in an arc from the Persian Gulf and Indian Ocean to the South China Sea and northwest Pacific. This will require the preservation of US superiority in air and naval warfare, and continued dominance in cyber-warfare, space technology and other specialised fields. Counter-terrorism will remain an important Pentagon function, but will be largely delegated to highly trained Special Forces equipped with killer drones and other high-tech paraphernalia. Managing the contraction of overseas interests and commitments — or, as some would have it, managing the decline of empire — is never easy. Other great powers that have had to undertake such endeavours — Britain and France after the second world war, Russia after the collapse of the Soviet Union — have found it exceedingly difficult. Often they have embarked on ill-advised military adventures, such as the 1956 Anglo-French invasion of Egypt (Suez) and the 1979 Soviet invasion of Afghanistan — actions that hastened the collapse of empire, rather than delaying it. When the US invaded Iraq in 2003, it was at the peak of its power; but the ensuing insurgency lasted so long and cost so much — an estimated $3 trillion — that the US has lost the will (and much of its capacity) to fight any new protracted ground wars in Asia. From here on, it is highly unlikely that Obama or any other American president, Democrat or Republican, would authorise a major operation akin to the interventions in Iraq and Afghanistan. Obama and his top advisers, cognisant of this history, are determined to avoid the strategic mistakes of earlier leaders. But if they recognise the folly of attempting to cling to all overseas commitments, knowing it would bankrupt the nation, they have no intention of presiding over a rapid contraction of foreign interests, seeing this as recipe for greater chaos and decline. Instead, they are seeking a middle way, choosing to reduce US commitments in some areas — Europe, in particular — while bolstering the nation’s capacity to prevail in areas deemed most important for America’s continued global supremacy. This means dominating the western Pacific and containing Chinese power. “In many respects, the broader Pacific will be the most dynamic and significant part of the world for American interests for many decades to come,” said Deputy Secretary of State William J Burns last November. For America to remain strong and prosperous, Burns indicated, it must concentrate its energies in this area and ensure that China does not gain power and influence to America’s disadvantage. “As Asia undergoes profound changes, we need to develop the diplomatic, economic, and security architecture that can keep pace”. This new “architecture” has many dimensions, military and not. On the diplomatic front, Washington has bolstered its ties with Indonesia, the Philippines and Vietnam, and reinstated formal relations with Burma. The White House is also seeking to invigorate US trade with Asia, and pushing for the establishment of a regional trade pact, the Trans-Pacific Partnership (TPP). This is implicitly aimed at countering the rise of China and its influence in Southeast Asia. By reinstating ties with Burma, for example, the US gains a voice in a country where China, until recently, had few competitors; the proposed TPP would exclude China on technical grounds. Alongside these economic and diplomatic moves are significant military initiatives. For Asian states to grow and prosper, American strategists believe, they must enjoy unhindered access to the Pacific and Indian Oceans (along with connecting waterways such as the Straits of Malacca and the South China Sea) in order to import essential raw materials (especially oil) and export manufactured goods. By establishing naval dominance in the South China Sea and adjacent waterways, the US could exercise a form of latent coercive power over China and the other states in the region, much as the British navy once did. American naval strategists have long been arguing for such a stance, claiming that America’s singular advantage lies in its ability to control the world’s major sea-lanes — an advantage enjoyed by no other power. It now appears as if the Obama administration has embraced this outlook. This was clearly implied in the moves Obama announced during his visit to the region in November. This will involve more frequent deployments by US warships and military exercises in the region. In addition, Obama announced the establishment of a new US military base at Darwin, on Australia’s north coast, and increased military aid to Indonesia. Implementation of this grand geopolitical vision has obvious implications for the development of military policy, and this is clearly reflected in the strategic policy unveiled by Obama and Panetta in January. “As I made clear in Australia,” Obama said, “we will be strengthening our presence in the Asia-Pacific [region], and budget restrictions will not come at the expense of that critical region.” Panetta added: “The US military will increase its institutional weight and focus on enhanced presence, power projection, and deterrence in the Asia-Pacific”. Although the policy document itself does not identify which specific military components will be favoured, it is clear that emphasis will be placed on naval forces — especially aircraft carrier battle groups — as well as advanced aircraft and missiles. Thus, while the US army will see a reduction in its total strength from approximately 570,000 troops today to 490,000 in 10 years’ time, Obama has vetoed plans for any reduction in the navy’s carrier fleet. Also, the US will invest substantially in weapons aimed at defeating potential adversaries’ “anti-access/area denial” (known as A2/AD) capabilities — the planes, missiles, and ships designed to overpower US attack forces (especially aircraft carriers) in contested areas. Because China is expected to enhance its capacity to strike American naval forces operating in the South China Sea and other areas on its periphery, US forces will be equipped with greater defences against these so-called A2/AD capabilities. As the new Pentagon blueprint puts it: “In order to credibly deter potential adversaries and to prevent them from achieving their objectives, the United States must maintain its ability to project power in areas in which our access and freedom to operate are challenged” — a clear reference to the East and South China Seas, as well as waters off Iran and North Korea. In these areas, it is claimed, potential adversaries “such as China” will use “asymmetric means” — submarines, anti-ship missiles, cyber warfare — to defeat or immobilise US forces. Accordingly, “the US military will invest as required to ensure its ability to operate in anti-access and area denial (A2/AD) environments”. This means that the US will place top priority on dominating the maritime periphery of Asia, even in the face of opposition from China and other rising powers. 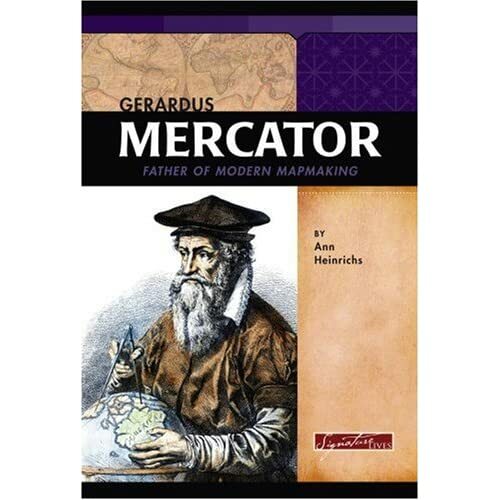 Today March 5, 2012 marks the fitfth centenary of the birth of Gerardus Mercator who developed the famous map projection able to represent lines of constant course as straight segments, thus preserving the angles, which proved useful in navigation. "New and more complete representation of the terrestrial globe properly adapted for its use in navigation." The 'Mercator projection' had the property that lines of longitude, latitude and rhumb lines all appeared as straight lines on the map. "... spread on a plane the surface of a sphere in such a way that the positions of all places shall correspond on all sides with each other both in so far as true direction and distance are concerned and as concerns true longitudes and latitudes." With his world map published in 1569, the title of the original map telling us as much (Nova et aucta orbis terrae description ad usum navigantium emendate et accomodata translated as “new and improved description of the world amended and intended for the use of navigators”), the Flemish cartographer presented a new method to portray the globe on a two-dimensional, angle-preserving map. This means that angles between the different directions on the map correspond to the directions on the earth’s surface. On this Mercator projection, Greenland and South America appear similar in size. The inset map shows that South America is actually about 15 times larger than Greenland. 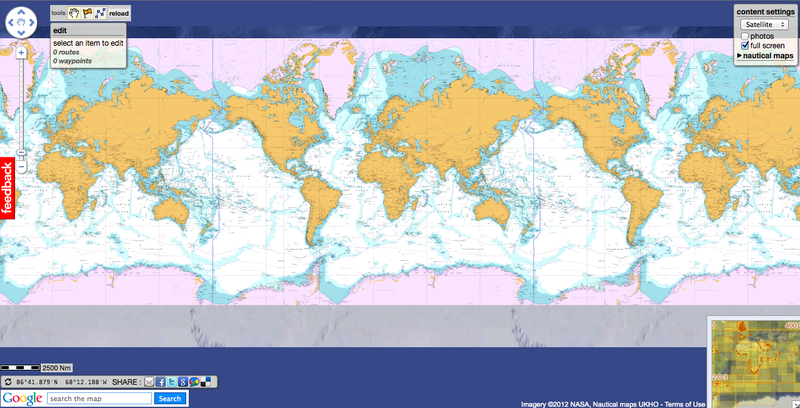 As it is impossible to project the spherical surface of the earth on a flat surface without distortion, Mercator’s cylindrical map projection uses these distortions to render them user-friendly for nautical purposes. it’s a conformal projection, which means that it preserves the shape of relatively small objects. This is especially important when showing aerial imagery, because we want to avoid distorting the shape of buildings (square buildings should appear square, not rectangular). Google Maps is based on a close variant of the Mercator projection : to simplify the calculations, Google Maps uses the spherical form of this projection also called WGS84 web Mercator (or pseudo-Mercator), not the ellipsoidal form. Since the projection is mainly used for map display, and not for displaying numeric coordinates (the Latitude/Longitude geographic coordinates of features on Google Maps are the GPS coordinates based on the WGS 84 datum), we don’t need the extra precision of an ellipsoidal projection. The difference between a sphere and the WGS 84 ellipsoid causes the resultant projection not to be precisely conformal. However, the discrepancy is meaningless at the global scale but causes maps of local areas to deviate slightly from true ellipsoidal Mercator maps at the same scale. However, the spherical projection causes approximately 0.33% scale distortion in the Y direction, which is not visually noticeable. Since the Mercator projection goes to infinity at the poles, it doesn’t actually show the entire world : so Google Maps cannot show the poles. 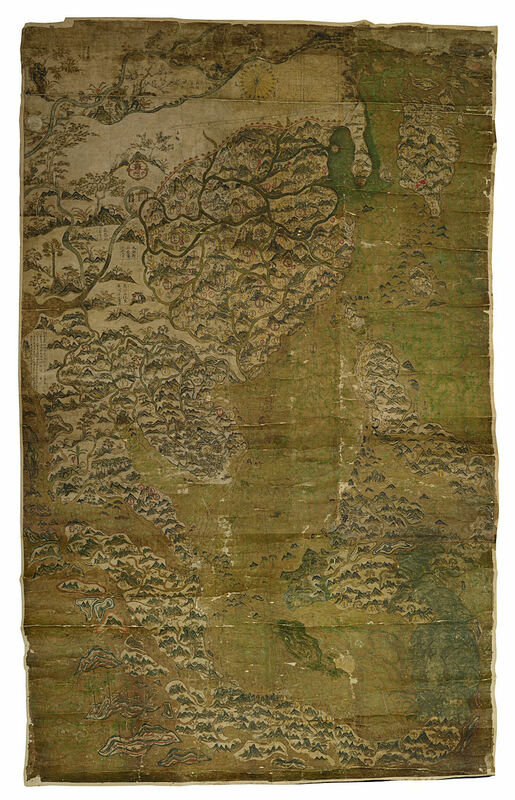 Using a square aspect ratio for the map, the maximum latitude shown is approximately 85.05 degrees north and south. Although cutting off coverage, this is not considered a limitation, given the purpose of the service for aid to navigation. The great circle route from Seattle to London is a straight line on the gnomonic map projection. Circular “compass roses” at points where the route crosses major meridians are projected as ellipses, showing the distortion of directions that makes it possible to measure true azimuths only roughly along the route. Portion of a world map made with the Mercator projection showing the rhumb line and great circle route from Seattle to London. The great circle route, obtained from a gnomonic projection, has been divided into 500 nautical mile legs. Since the Mercator projection is conformal, each simplified compass rose is correctly projected as a circle. Originally designed for use in nautical navigation, Mercator's projection is a map of the Earth's surface on which straight lines, called rhumb lines (or loxodromes), represent a course of constant compass heading.